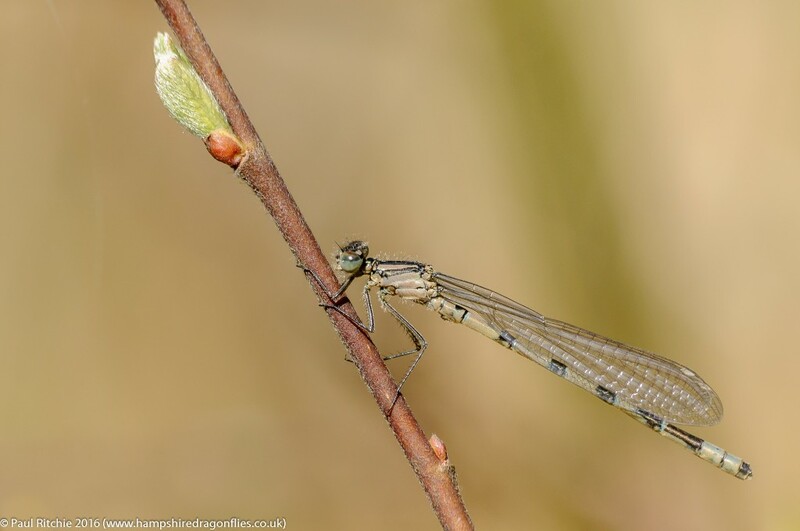 The delayed spring has resulted in a flurry of May delights with several summer species joining the fray, although there still appears to be a subdued feel to most places as these young adults disappear to feed, mature and grow. Thankfully one of my favourite spring sites always give me moments of pleasure. Troublefield was positively brimming with fresh Beautiful and Banded Demoiselles, and so long as you are up for the chase and patient they can provide some stunning photography opportunities. 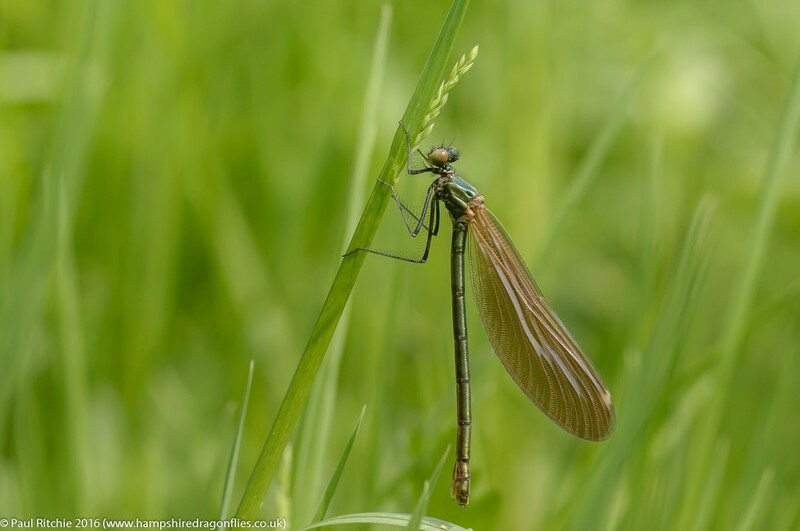 This pristine water meadow is rife with feeder insects and provides the perfect crèche for maturing adults. 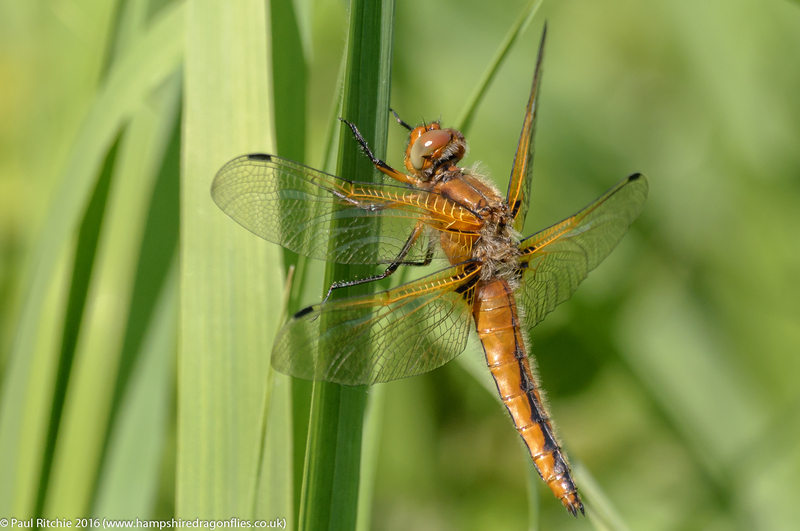 A pristine but flighty female Broad-bodied Chaser gave me the run around twice, helped by a Scarce Chaser drawing my attention away from her. Every spring there’s always a pleasant surprise to be found at Troublefield; whether it be an early maturing Emperor, a visiting Hairy or a fresh and early Golden-ringed. This year it was the latter which made my morning. 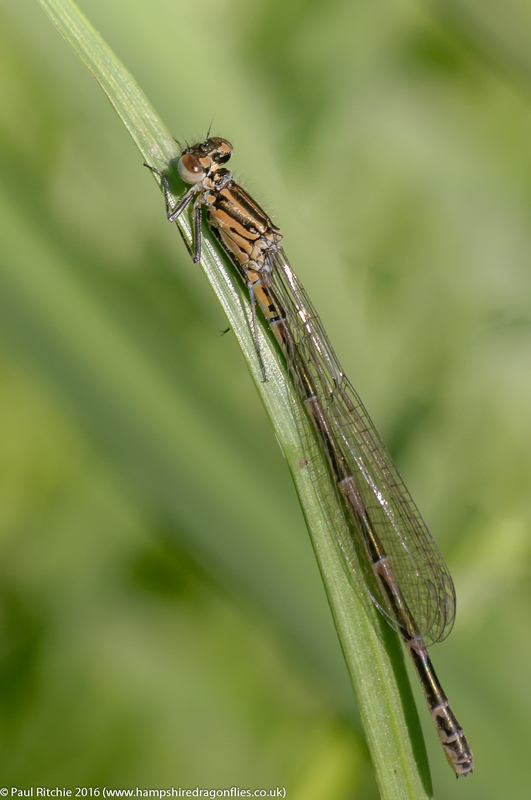 Visiting Cadnam Common on the way back the pond activity isn’t yet as furious as you would expect in late May with only a few Chasers battling for supremacy and just the one male Downy patrolling. Still, at least it’s looking healthy and given a week or so should provide the splendid spectacle which first fired my interest. 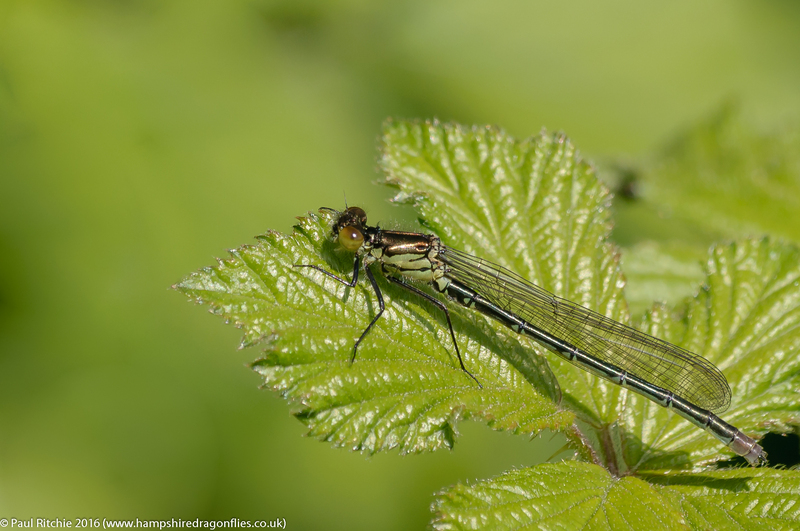 On Friday afternoon Sue & I took a walk around Swanwick Nature Reserve in the hope we would find a willing Blue-tailed or two. We did find a small selection this time, although they were warm & flighty and seemed determined to make me work for it. At the entrance to the meadows we were faced with signs and painted markers ordering visitors to remain on the paths and stay out of the meadows. There seems to be a misguided culture of turning our threatened wild flower meadows into museum artifacts by placing them behind fences and screens and preventing our enjoyment instead of educating us through interaction. Such rules and regulations will further prevent our love and enjoyment and eventually refer them to history. This being an urban Nature Reserve means it is used by dog walkers and these utilitarian methods are probably a result of irresponsible owners not keeping there charges on leads. 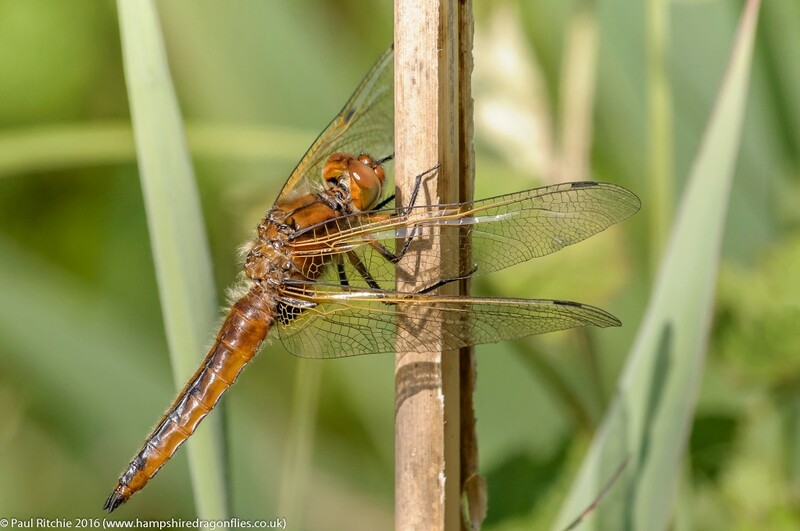 They’re certainly to blame for the state of ‘dog pond’ at the far end of the reserve, although the Large Red and Broad-bodied Chasers seem to thrive in the filth. 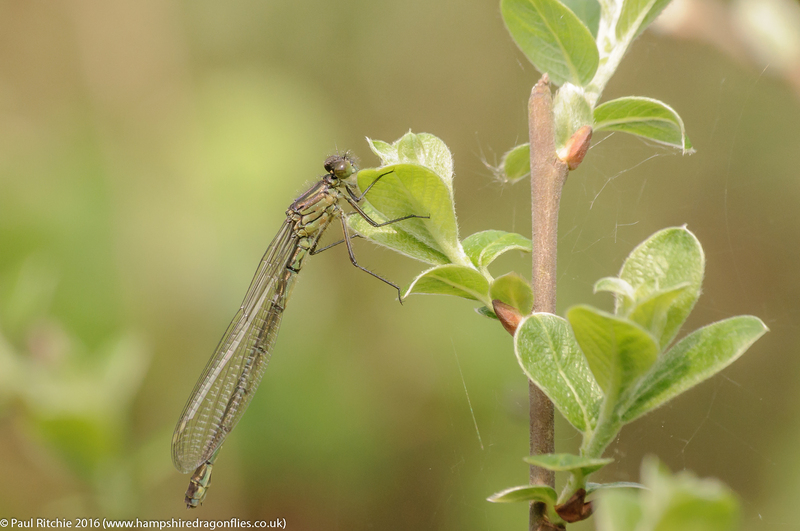 On our visit there were a couple of males patrolling, a female ovipositing and two just-emerged females which flew into the canopy with our passing. So a little to see and a chance to take a local couple of hours exercise, but I do wish I would come away wanting to visit more frequently. The satisfaction I received from such a bountiful day in the Somerset Levels satisfied my cravings for a whole week. Certainly the weather didn’t inspire me enough to venture out knowing that the majority of us still have to reach our Spring bounty. Usually by this time you can be guaranteed a day of splendor at most ponds given a warm, sunny day. We didn’t have one of those days on Sunday in Bentley Wood, but it was by no means bad to begin with. I was certainly expecting a lot more to keep me occupied, even if it was just some fun with the damsels, but even here the pickings were less than slim. Just a dozen or so Azures and even less Large Red. Just the two Blue-tailed and no sign of any Four-spotted or Broad-bodied Chasers although did have a passing visit from a Downy Emerald before the clouds rolled in, and we received a grand soaking on the way back to the car. The weather looked promising on Monday, but looked better on Tuesday, and a day to warm up should kick-start some action. An early start at Bramshill to make the most of it found tenerals rising from the water, a fabulous sight which continued all day and made a change from the showers of seeds and pollen filling the rides. Most of these tenerals rose high and made for the trees, while those without such self-assurance alighted on the nearest refuge, me included. I could’ve made a day of teneral chasing but I did have a purpose today; to chase down a Downy or two. There were certainly a few rising with my passing down hawker alley, and one or two even provided a moments hope as they circled but they decided to fly beyond my reach. 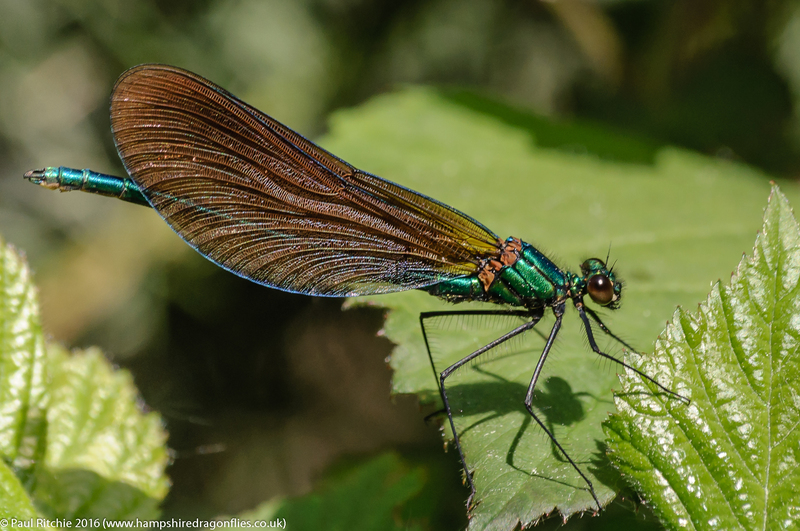 I saw a few more along the rides but the rides belonged to the Beautiful Demoiselles today. Hundreds of them dancing in the sheltered, sunny clearings. When I returned to Long Lake I bumped into Mike Barnett at the shoreline and decided to join him grabbing more than a moments enjoyment perched in the shallows determined to capture one of these elusive Downy Emeralds while they were on the wing. Satisfied I’d got my prize I decided to continue by transect around the other shoreline and through the jungle. Still plenty of tenerals rising but with the clouds drawing in all water action had more or less ceased. 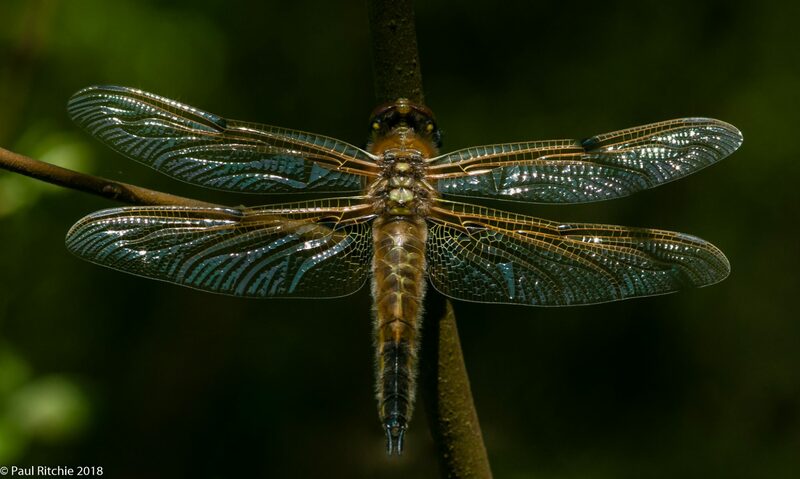 I spent a little time with one of the Four-spotted Chasers before deciding to call it a day. On the way out I bumped into Aaron Cook (and Molly of course) rounding off the day with a good chat and some plans for the near future. Watch this space. 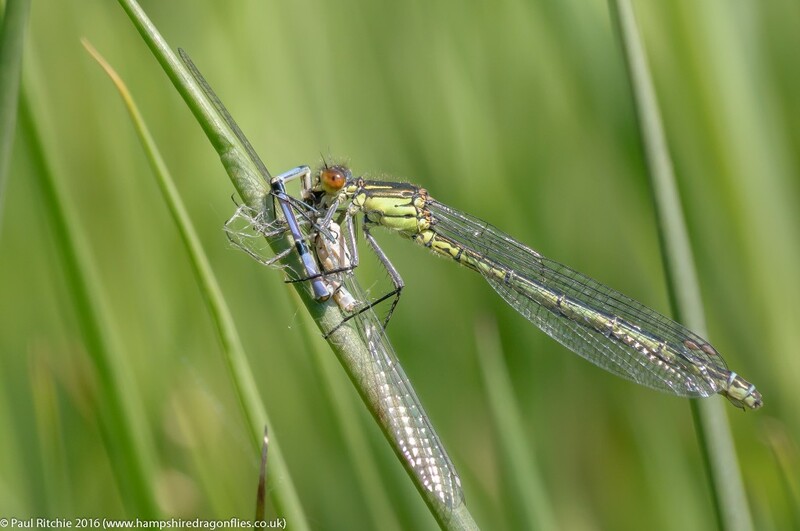 Every year around this time Doug & I like to make the pilgrimage to the wonderful Vale of Avalon for the bounty of Spring species, especially the Hairy Dragonfly and Variable Damselflies, the latter of which is absent from South Hampshire. The Hairy is present, albeit very local and in small numbers. 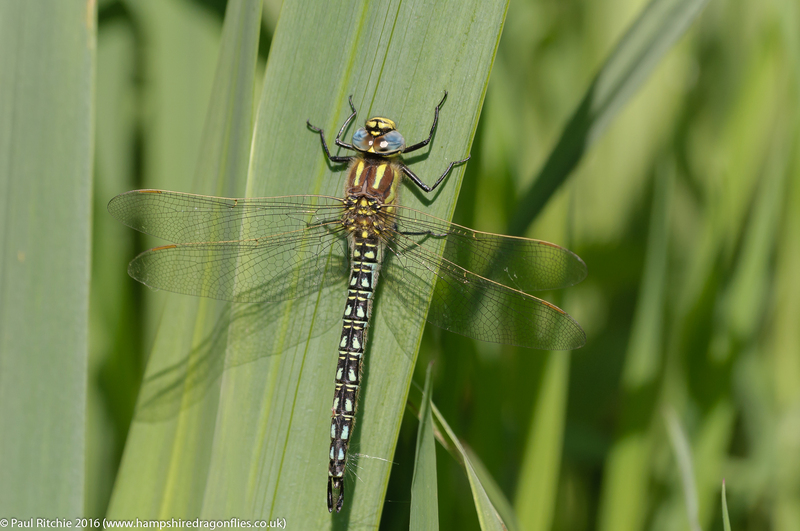 We were barely through the gate when we observed enough activity to keep us amused with both of the above, Azure, Large Red, Red-eyed and Blue-tailed along with Four-spotted and – most welcome – an emergence of fresh Scarce Chasers. 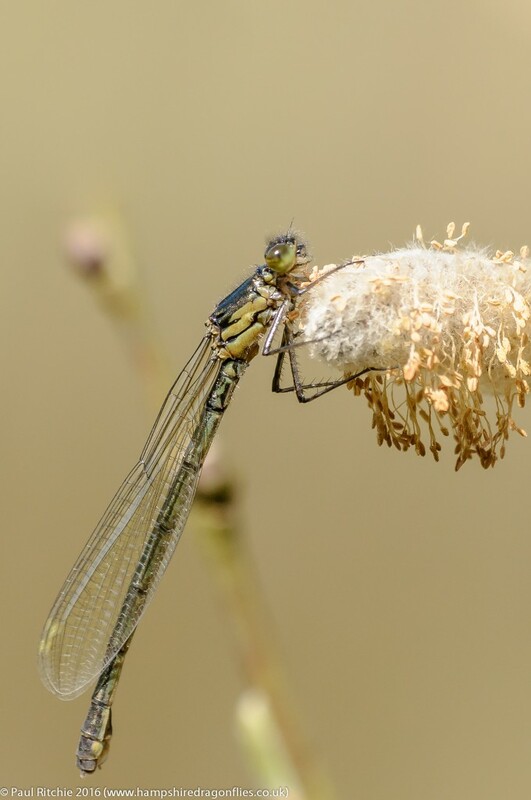 Among the many delights of the Somerset Levels is the chance to engage with the Red-eyed at close quarters, instead of their preferred perch out on inaccessible lily pads. I wanted to engage more with the Variable this time, taking time to observe their behavior with the intention of picking them out among the Azure from a distance. Once you get your eye in the bulkier appearance and more determined flight are good indicators when you can’t get a close view of their subtle differences in markings. One of the great delights with unfamiliar species is coming across an immature colour form which is as beautiful as it is unexpected. With the gentle rise in air temperature we had our first sightings of Hairy rising from their shelter in the bank to feed along the tree-line. An obliging female gave us our first opportunity. Down in the microclimate of the grassy banks it’s very much dog-eat-dog. The damselflies were right to be cautious, although the danger didn’t lie with us. Watching the damsels was both entertaining and informative. The Red-eyed certainly appeared to be the bulldog of the bunch; stocky, fast and powerful. 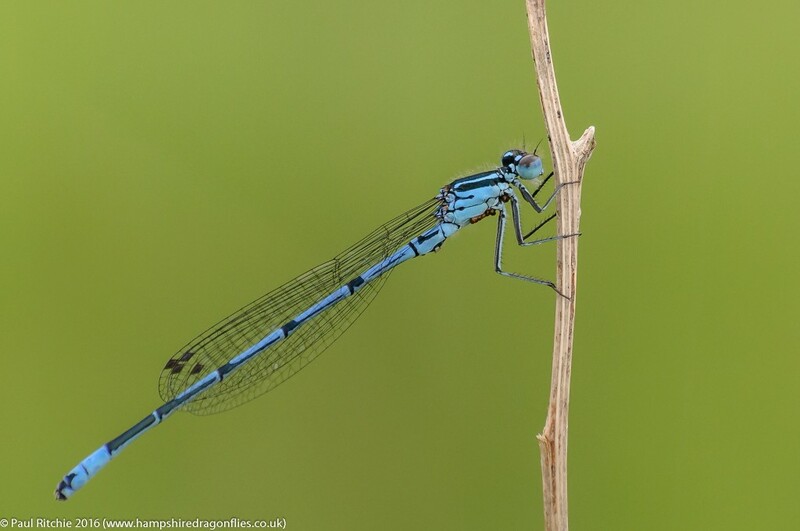 At the other end of the spectrum was the diminutive Blue-tailed appearing to casually drift with the breeze, although they too had a purpose. Another benefit of keeping your eye close allows you to come across delights you might’ve missed. 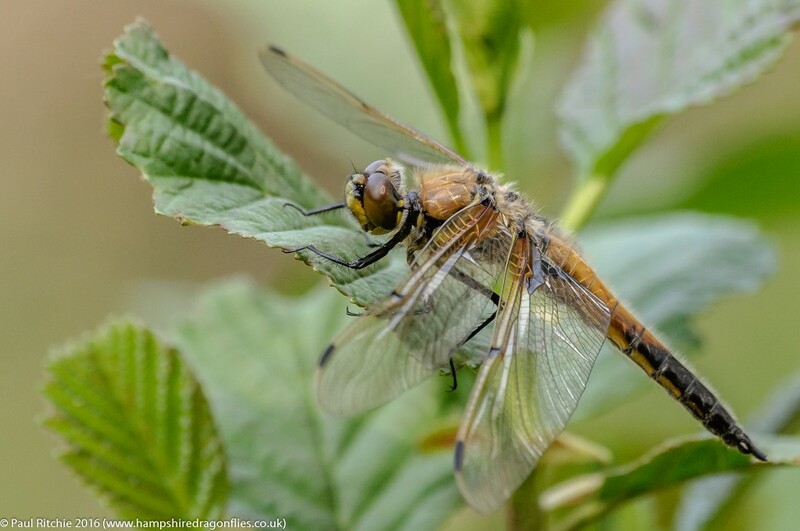 -We did have a smattering of Four-spotted and the odd Broad-bodied, but the day really belonged to the Scarce Chaser with numbers increasing during the afternoon. A walk along the Sweet Track brings you to a permissive path crossing a glorious spring meadow where several female Hairy were resting down low in the grass while the reeded margins provided the perfect backdrop for incoming males. An enjoyable, educational and productive day can satisfy the cravings for a good few days and if the sun had made an appearance outside my window this week I probably ignored it. I need more days like these! Trying to curb my natural desire to get out as quickly as possible I took a leisurely approach on Thursday, arriving at Bramshill at around 11.30am. Instead of heading to the ponds first I decided to check out ‘hawker alley’ in the hope of finding a Downy. On the way through I had a couple of Four-spotted Chasers cross over from the lake to the sanctity of the treeline; they’re always wary in their teneral state. When I arrived at the main track I paused for a polite conversation with a dog walker and was immediately distracted as a Downy flew overhead. Thankfully once pleasantries were over I noticed another changing position low in the path-side vegetation. Not the best of positions, but better than nothing as her next choice was at least 100 metres away at height. I saw one more along the track before returning to Long Lake. This side of the shore was still waking up so I headed into the overgrown depths of the thicket. Once I’d navigated to the shore the air exploded with teneral Large Red, Common Blue and Red-eyed, the latter in far bigger numbers this week. The small ponds didn’t produce anything of interest although Mike had spotted some Hairy during his Thursday visit. Feeling that the rides might be a better option, I decided to take a long walk in search of some other water bodies to the east. The one I was looking for turned out to be a mostly shaded, but the exercise had produced a greater insight into Bramshill, with some access to the shore of another lake where another Downy was spotted, and some rather marvelous sheltered rides and clearings. 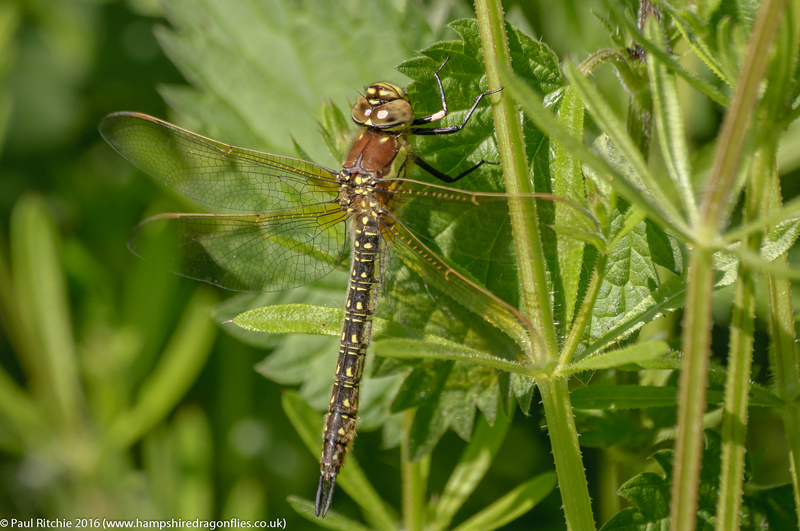 In one of these clearings I came across my first Broad-bodied Chaser of the season. 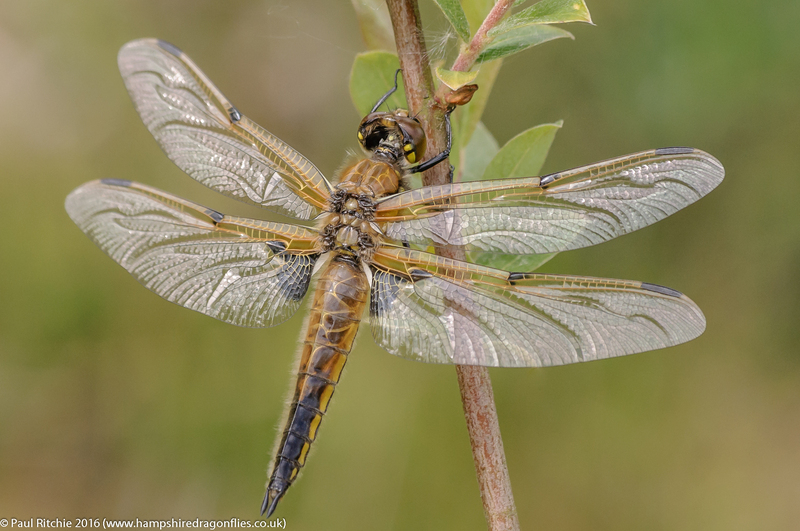 Returning to the promising pond found last year (and visited last week) there were a few more damsels around the grassy margins, but the surprise came in the form of a beautifully new Four-spotted Chaser, rising from the shore and thankfully choosing a perch low enough to get to. By now the sun was hiding behind some heavy cloud and I decided to call it a day. On Friday I decided to head west to Troublefield to see if it had woken up. The meadow is still wet and still a little immature on the flower front, but I chose the right day to witness the awakening of the Beautiful Demoiselles. At Ramsdown the wind was a problem. Just the one FSC spotted and a few Large Red, so cutting the visit short I decided to check out the large pond near Ringwood. The wind was also a problem here, but it did allow me to engage properly with some Blue-tailed. One more week and we’ll be sorted! At Last! The Great Awakening! 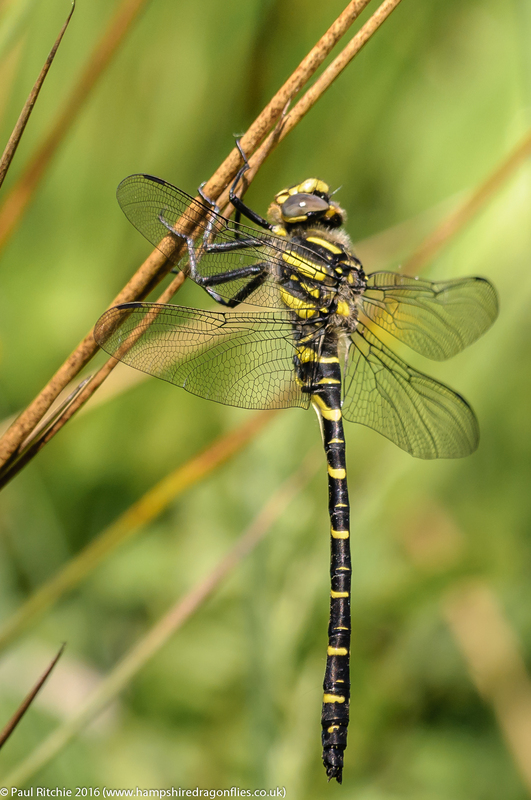 All we needed was a succession of sunny days to allow a rise in temperatures to kick start the dragonfly season in style. Gently at first with a smattering of Large Red followed by Common Blue, Red-eyed, Blue-tailed and even Four-spotted Chasers at Bramshill mid-week. 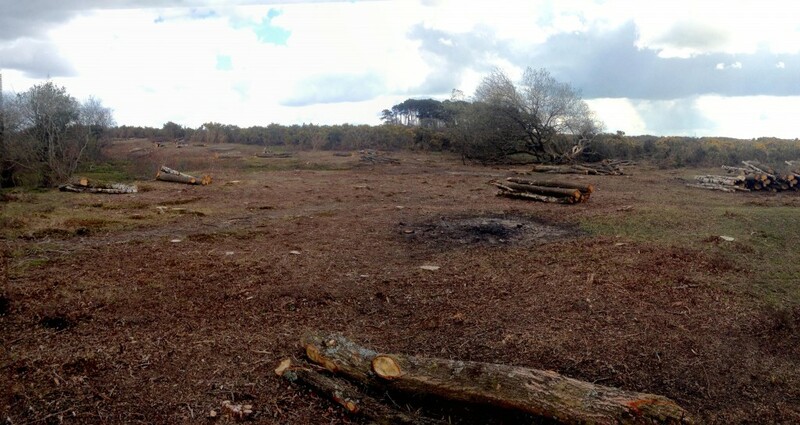 My first trip to Bramshill on Wednesday was more of a scout just to see what was about. 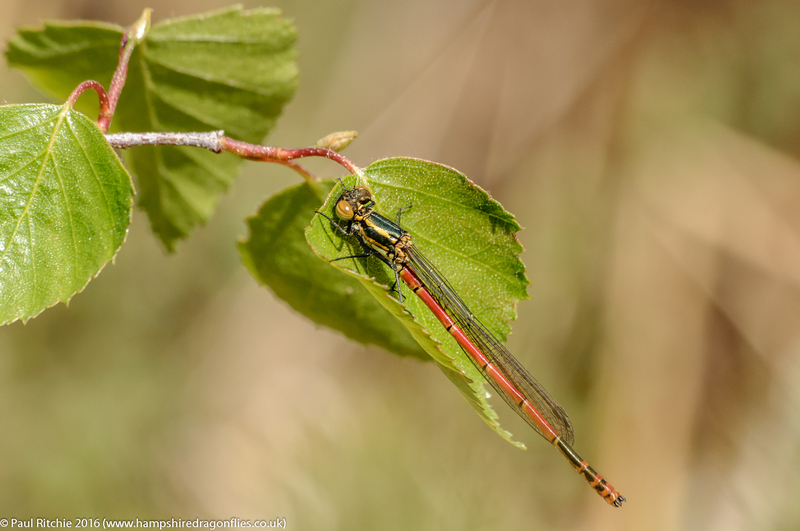 Just a few large Red around the small ponds, and a fair smattering in the sheltered areas bordering the lakes. 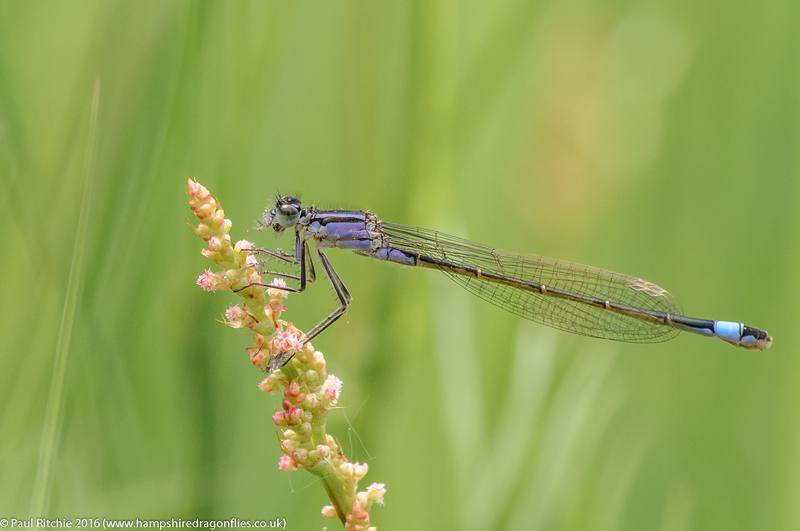 I was hoping for a Blue-tailed, Common Blue or even a Red-eyed, but it wasn’t going to happen for me today. 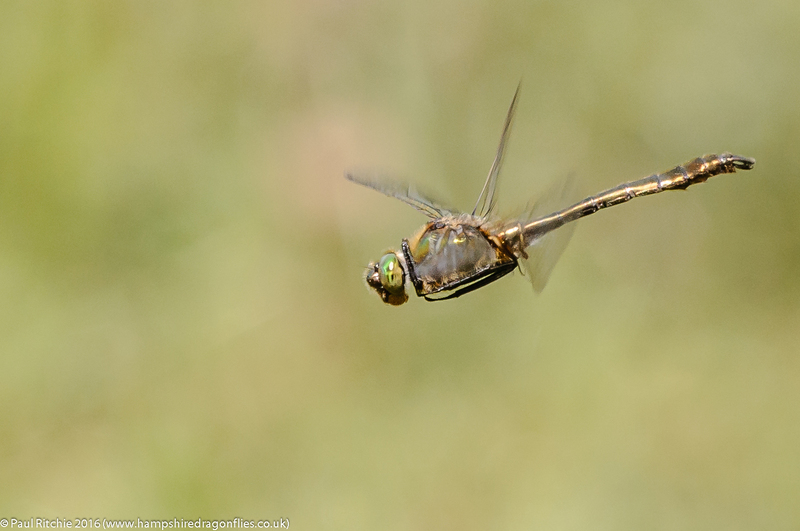 I bumped into Mike Barnett for a joint effort early on and later at the pond area where I found him stalking a Four-spotted Chaser which unfortunately flew into the treeline before either of us could attempt a shot! Next morning I received an e-mail from Mike asking for ID on some photos he’d managed while we were off on separate paths only to find the lucky sod had bagged a Red-eyed! That and the FSC more or less guaranteed a return visit Thursday. Thursday turned out to be a far more enjoyable and productive day with my first Red-eyed of the season bagged. 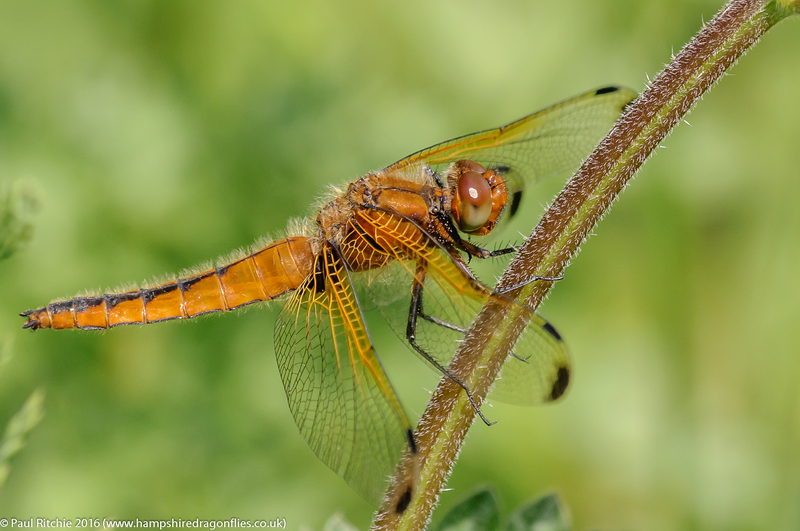 Large Red were predictably in larger numbers and while we were staring across the reeds another Four-spotted Chaser flew across the reed tops on a mission known only to itself. No worries…at least I managed to increase my season count once more with a Common Blue. The south-east shore of Long Lake was all but empty of life on Wednesday, but on Thursday there were a lot of tenerals rising to the trees. 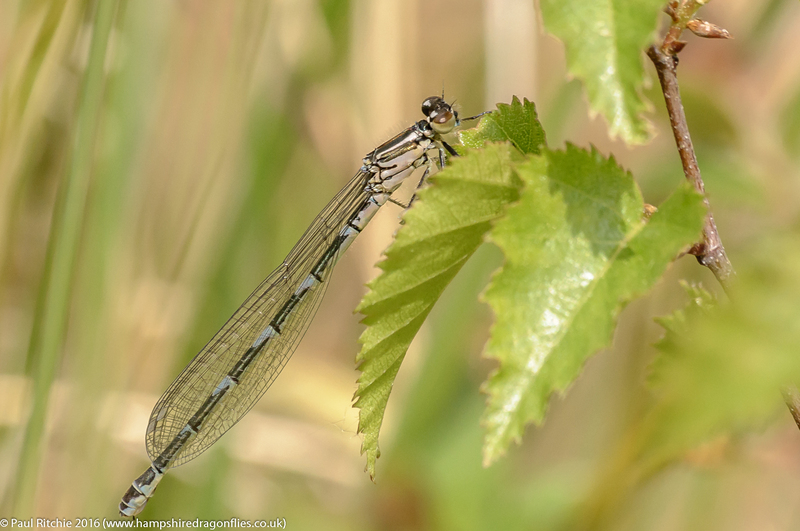 A search of the shoreline provided a fresh Blue-tailed. Three new species in one day? I call that a result! 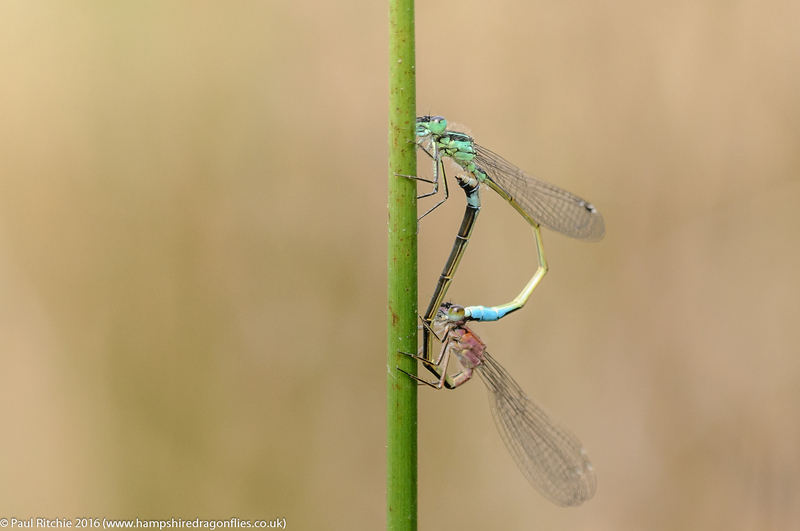 On Saturday afternoon Sue & I took a trip to Swanwick where life had tentatively began with a few Large Red and Azure if you looked hard enough. Hamble Valley was much better. 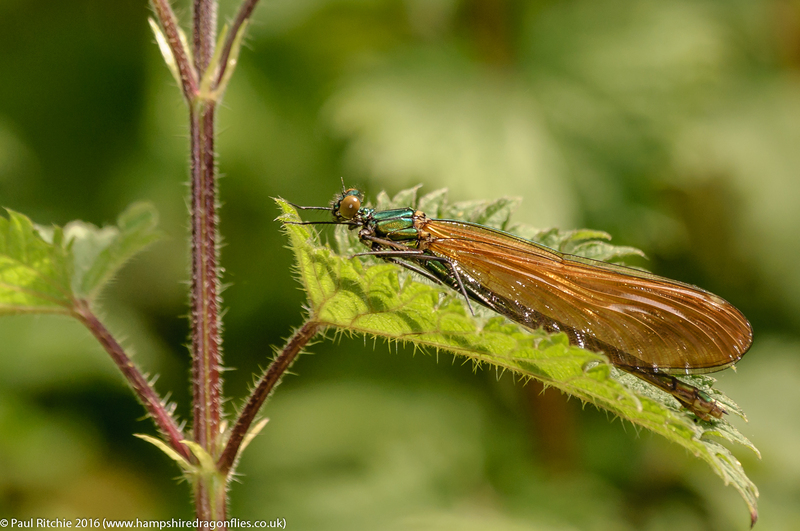 No sooner had we reached the top of the bank that the sight of a fresh Beautiful Demoiselle rose into the treeline. They’re here then. Let’s delve a little deeper. The wooded shore is steep, boggy and sometimes treacherous, but that didn’t stop me searching every nook & cranny for an individual which would stay still for long enough to focus on in this dappled light and shadow. Another result and a cracking week where everything happened at once. That’s just how I like it. 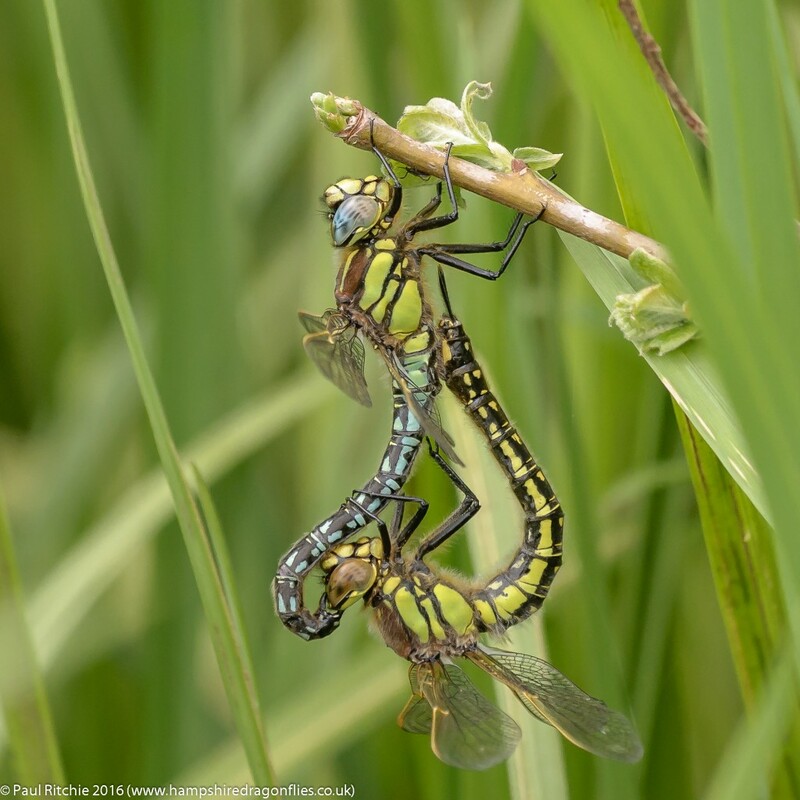 Reports from elsewhere reveal Broad-bodied Chasers, Hairy Dragonfly, Downy Emerald and even White-faced Darter, so the season is well under way. I apologise in advance for the negative title and content. Just when I thought April couldn’t get any worse, it did. 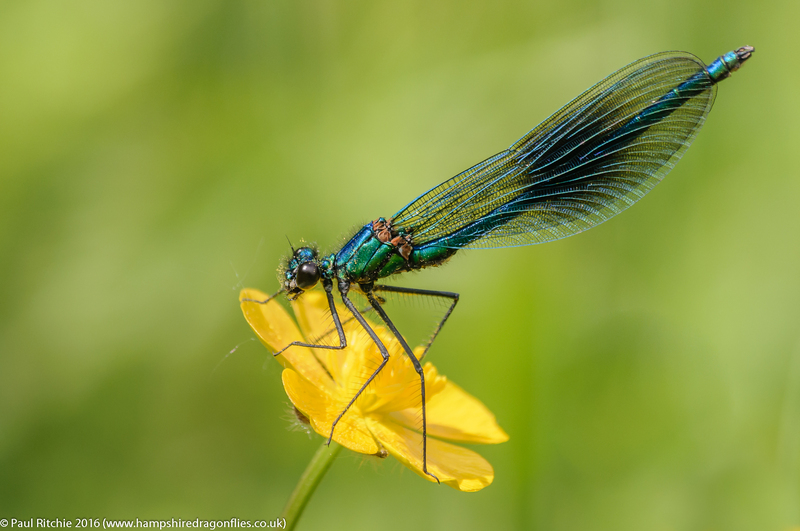 Despite the scattered sightings of Large Red, sprinklings of variety with Blue-tailed, Beautiful Demoiselle, Hairy Dragonfly and our Spring Chasers in various Counties, it’s all been a little quiet here in Hampshire. This of course is down to the weather. No self-respecting dragonfly is going to emerge into cold & wet conditions, and those which did may have perished in some late frosts. I like to punctuate April with observing and photographing Spring Butterflies but they too have been delayed through unsuitable conditions. There is of course a positive to take from this. Very soon everything will arrive at once; May being optimal for observing our Spring species, and I can’t wait! A long, satisfying day where time disappears rapidly through sheer diversity and enjoyment should help us forget the past month. However it may be difficult to forget the sheer destruction carried out at Crockford Stream out of season. Those of you who are familiar with this cracking dragonfly paradise will stare in dismay at the unrecognisable view which greets them. The thicket which divides the key clearing from the road is no longer there. It has been razed to the ground. So too have the long stand of gorse leading up the valley lining the old marl pits. 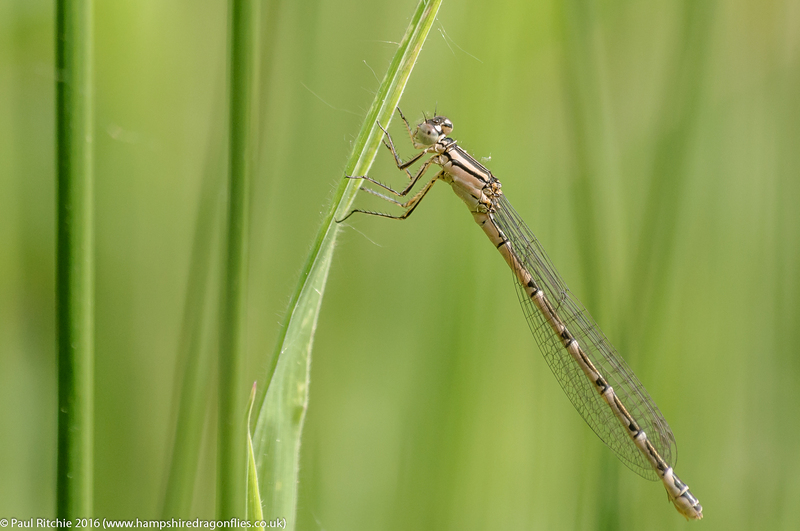 All of those refuges of shelter have gone in an effort to open out the stream, supposedly to benefit the Southern Damselfly, but I really do think they’ve gone to far. 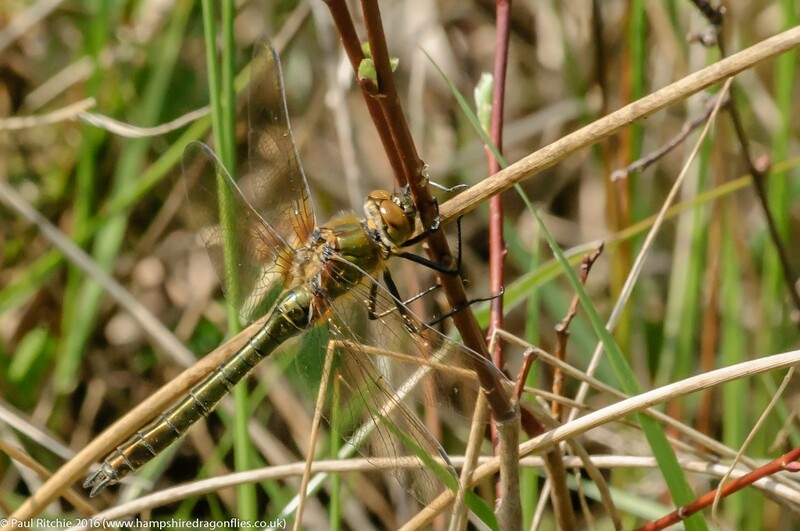 Dragonflies need these trees and areas of scrub to feed and shelter. Their main food insects congregate around these sheltered micro-climates. They are as vital as the open areas used for procreation. Taking the sledgehammer approach has opened up this once fine area to the elements and you (and the insects) will notice the slightest breeze. You only have to take a walk along Ober Water to realise all of the main activity over water is around the sheltered areas. Although after seeing what they’ve done to Crockford I’m apprehensive about my first Ober foray this season. Had I not been subject to a darkening of the clouds (reflecting my mood) along with a hail shower I might’ve stayed around a little to document the full effect of this clearance. As it was all I managed was a snapshot with the phone of the section looking north from the stream crossing with what remains of the thicket in the foreground. Now I’ve had assurances that ‘it will recover’ and ‘this will be beneficial in the long term’ and so may it be, but there’s no denying the experience previously had at Crockford will not be as enjoyable for the foreseeable future.